A passion for history, archeology and ancient structures inspire my work. To create pieces for both men and women, I use traditional metalsmithing techniques. In my latest series, I hand carve raw marble into miniature column fragments and forge, fabricate and rivet sterling silver to evoke the feeling of iron. 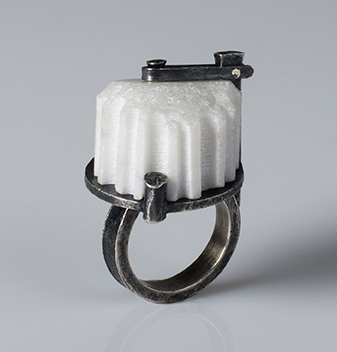 The ongoing collection of rings are hand carved, cast and hand fabricated with careful attention given to the patina to emphasize the sculptural quality of each element. Monumental structures that once towered above us have been distilled to glimmering icons to be worn on the body.